Sometimes we, women worry and think too much. Whenever we wanted to do something or make any decision we tend to think and think of all the possibilities, what are the consequences and etc…. Haiyoh!!! If you wanted to do something or make a change in your life please go ahead after all you only live once. Well, before you execute your plan you should also make a Calculated Risk during the Process of Decision Making. Once is all done then you can focus on your execution and stop thinking or worrying about it anymore. Don't let what you can’t do interfere what you can do. Don't let negative thought conquer your mind. 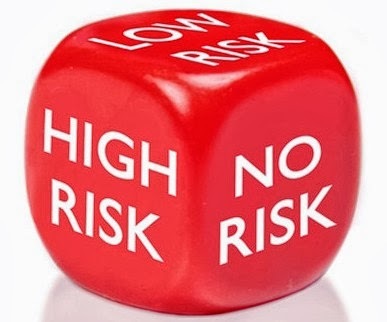 Calculated risk is a more structured and logical way when it comes to decision making. It does not involve emotional, purely based on facts, figures and analysis. Of course this is for a bigger decision making in life. Whereby you start looking the bigger picture or switch your mind to macro thinking. Once you are done with the decision then you can start to deal with execution process whereby the all details start to crawl in. That is the time you only use micro thinking, I know women are better with details. Now this is your strength and go make it happen. My 2014 resolution is very simple, I don't let what I can’t do interfere what I can do and I don't allow any negative thoughts to affect my life. There are lots of Ah Bad or people who will put us down so we need to shield ourselves from all these people. Decision making is important, you must have a clear and strategic plan before you jump into any conclusion. Fail to plan is plan to fail. Please also try not to involve emotion when you are making decision. All the best in 2014.